Pâques (Easter) simply has to be one of the most enjoyable holiday celebrations for French children and for chocolate aficionados of all ages. Every single one of those eternally beautiful Parisian Chocolate shops kicks up their fanciful-factor to ultra high levels as Easter approaches. The Easter-chocolate season begins weeks before the actual date. Giving chocolates to friends, family, and especially children is essential to a properly delectable celebration of the holiday. Shop windows are chock-full of a festive menagerie including white and dark chocolate rabbits, chickens, ducks, bunnies, bells and fish. Yes, bells and fish! And of course, France being France, while there are abundant and adorable chocolate animals to give and to devour, there are also more refined delights like impossibly delicate real egg shells filled with rich chocolate, tiny candy eggs resplendent in spun-praline ‘nests’, or chocolate eggs filled with luscious hazelnut or pistachio creams. While seasonal chocolates are central to the many nationalities that celebrate Easter it seems that bells and fish are uniquely part of French Easter traditions. Those delicious candy fish are called Poisson d’Avril. 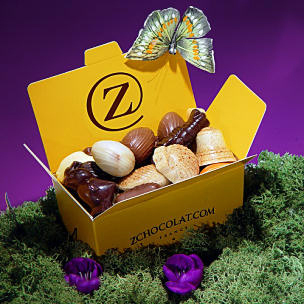 Come Easter-tide, swarms of chocolate fish fill candy shop windows all over the City of Light. They come in varied sizes, some packed in shiny tin boxes holding small schools of fish all wrapped up in silver-blue foil. They are also sold unwrapped, by weight, in all their pure chocolaty glory. The smallest fish, often called ‘friture’, are made with 70% dark, milk, or orange flavored chocolate. Sometimes the tiny friture are nested inside a large chocolate egg. Madame Dominique Leterrier, the charming owner of Natier, a worth-the journey little chocolate shop at 1 rue Henri Monnier in the 9th arrondissement tells me that the larger sizes of chocolate fish are often molded to resemble either a pike or a carp by the artisanal chocolate-makers that supply her delectable confections. Natier offers chocolate-fish large and small, all wrapped and be-ribboned beautifully at the time of sale. Of course there is a story behind those fish and bells. Interestingly enough, the story behind Poisson d’Avril is both about Easter and about an April-Fools trick. Poisson d’Avril appear just before April 1st when mischievous French children stick paper fish on to the backs of as many unsuspecting adults as possible, then run away yelling “Poisson d’Avril!” The tagged adults, always graciously un-offended, respond by giving kids gifts of chocolate fish. Leave it to the French to turn April Fools into April Fish! 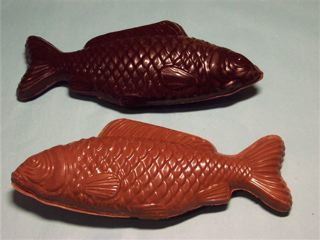 And so chocolate fish enter the Easter candy menagerie. What about the bells? Cloche volants or ‘Flying Bells’ are another important symbol in the French Easter tradition. Traditional belief holds that on Good Friday all the church bells in France miraculously ‘fly’ off to the Vatican. The bells carry all the grief of those mourning Jesus’ crucifixion. These flying French bells then return to their steeples on Easter morning just in time to ring for the celebration of Jesus’ resurrection. The bells also bring back chocolate and decorated eggs just in time for children to collect when they wake up on Easter morning. In keeping with this tradition, French church bells do not ring from Good Friday to Easter morning. Thus, French legends, April Fool’s jokes and gastronomic tradition blend in serendipitously lovely ways when it comes to Easter in France. Next articleHow Many Ways can you say the Economy is Rotten?